PLEASE READ CAREFULLY THE SHIPPING TERMS FOR THIS LP BOX SET, AS OUR SHIPPING TERMS FOR THIS ITEM DIFFER FROM OUR OTHER AUCTIONS. · ALL ALBUMS WITH EXTRAS (‘SGT. PEPPER’ AND ‘WHITE ALBUM’) COME WITH THEIR ORIGINAL INSERTS: SGT. PEPPER CUTOUT INSERT (FOUND IN SGT. PEPPER) IS INCLUDED, AND FOUR BONUS COLOR PHOTOS WITH A LARGE POSTER (FOUND IN THE ‘WHITE ALBUM) ARE LIKEWISE INCLUDED; THE VERSION OF THE WHITE ALBUM POSTER INCLUDED HERE IS HISTORICALLY ACURATE ‘UNCENSORED’ UK VERSION, NOT THE “NEUTERED” AMERICAN VERSION; THE 'WHITE ALBUM' IS EMBOSSED (THE TITLE IS 'RAISED') BUT NOT INDIVIDUALLY NUMBERED. · FAIRLY THICK VINYL PRESSING On the scale from 1 to 10 (1 being the least, and 10 being the most severe), we assess the thickness of the vinyl as 6. 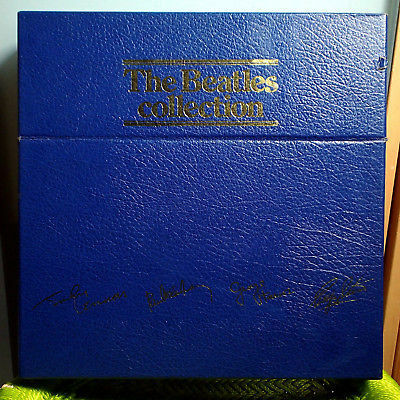 The Beatles Collection is a boxed set of vinyl albums released in the United States in November 1978 and the following month in the United Kingdom containing the official catalogue of The Beatles in stereo, and a new compilation called Rarities. The American issue by Capitol Records contained the British pressings of the same 12 original Beatles albums, with an American pressing of Rarities. The American pressing of Rarities differed from its British counterpart in that it included the previously released English-language versions of "She Loves You" and "I Want to Hold Your Hand," rather than the German-language version found on the British pressing. The American edition of the boxed set was a limited edition of only 3,000 numbered copies. The limited availability of the American release resulted in the British release becoming popular as an import into the US. The boxed set did not include some of Beatles recordings, including those released on the Magical Mystery Tour album. The album had been released in the United States in 1967, but it was not counted among the group's official catalogue because it was not issued in the United Kingdom until 1976. The collection also failed to include the non-album singles that had been previously released on the twin compilation packages, 1962–1966 and 1967–1970. Along with the LPs listed below with their sleeves, the collection also include the inserts contained in the individual albums including the cardboard cutout sheet in Sgt. Pepper's Lonely Hearts Club Band and the photos and poster in The Beatles. Audiophile company Mobile Fidelity Sound Lab released a similar boxed set in 1981 called The Beatles: The Collection consisting of the 12 British versions of the albums (Rarities was not included, but Magical Mystery Tour was), pressed off the original Abbey Road studio master tapes (except for MMT) using a technique called "Half Speed Mastering" and pressed on Japanese "virgin" vinyl. The set was highly acclaimed for its sonic accuracy and only approximately 25,000 were released. In this case, the actual covers for each album was a photo of the studio master tape along with the engineer's log sheet. The original album covers were put together in a full-sized booklet. · PLEASE NOTE: YOU MAY NOTICE THAT ‘MAGICAL MYSTERY TOUR’ IS MISSING. THIS IS NOT BECAUSE THIS SET IS INCOMPLETE (ALL VOLUMES ARE INCLUDED HERE, NOTHING IS MISSING) BUT BECAUSE MAGICAL MYSTERY TOUR WAS NOT ORIGINALLY ISSUED IN THE GREAT BRITAIN AS A 12-INCH LP ALBUM UNTIL MANY YEARS LATER (IT WAS ORIGINALLY RELEASED AS A DOUBLE EP), SO ITS INCLUSION IN THE BEATLES LP COLLECTION WAS APPARENTLY CONSIDERED TO BE OUT OF PLACE, PROMPTING EMI/PARLOPHONE NOT TO INCLUDE IT IN THIS SET. (a) WE GRADE THE VINYL AS STRONG NEAR MINT. The original luster is very much intact, and the vinyl shines and sparkles almost like new. The records do not appear to have been played much - if at all - over the past 40 years. No spindle mark to be found anywhere! (b) The records are apparently pressed on a RELATIVELY thick, inflexible vinyl. This is NOT a thin, flimsy ('dynaflex' type), vinyl, but not the thickest, most rigid vinyl, either. (e) All bonuses and extras ARE included. For example, Sgt. Pepper should come with its original cutout insert. The White Album does have BOTH poster AND the four bonus photos (we can see the poster tucked into the still sealed album, while the photos are attached as a separate insert to the set).. The only thing missing is Sgt. Pepper’s custom “psychedelic” inner sleeve, which we understand was NOT originally included in the original package for some reason. THE COVERS ARE MOSTLY NEAR MINT; THE MOST COMMON FLAW FOUND ON THE JACKETS ARE THE MINOR WRINKLES ALONG THE SEAMS; 'RARITIES' VOLUME HAS NEGLIGIBLE TRACE OF RING WEAR; A FEW VOLUMES (PLEASE PLEASE ME; WHITE ALBUM; YELLOW SUBMARINE) HAVE CRACKS IN THE TOP SEAMS; THE SEAMS ARE JUST BEGINNING TO SEPARATE; OTHERWISE IMPECCABLE. THE TEXTURED, LEATHER-LIKE SLIPCASE IS IN VERY GOOD++ TO EXCELLENT CONDITION; TRACE AMOUNT OF RING WEAR (VIRTUALLY NEGLIGIBLE) NOTED; ONE VISIBLE 3/8-INCH DENT NOTED ON THE LID OF THE BOX (VISIBLE ON FRONT SIDE ONLY; NO PIECE OF THE CARDBOARD IS MISSING); SMALL TAPE RESIDUE STAIN NOTED ON THE BOTTOM SIDE (WHICH CAN PROBABLY BE REMOVED WITH A MINOR EFFORT), AND A SMALL COUNTRY OF ORIGIN STICKER (MADE IN ENGLAND) STICKER NOTED ON THE BACK PANEL.